Oh, Born-Free how I love thee! 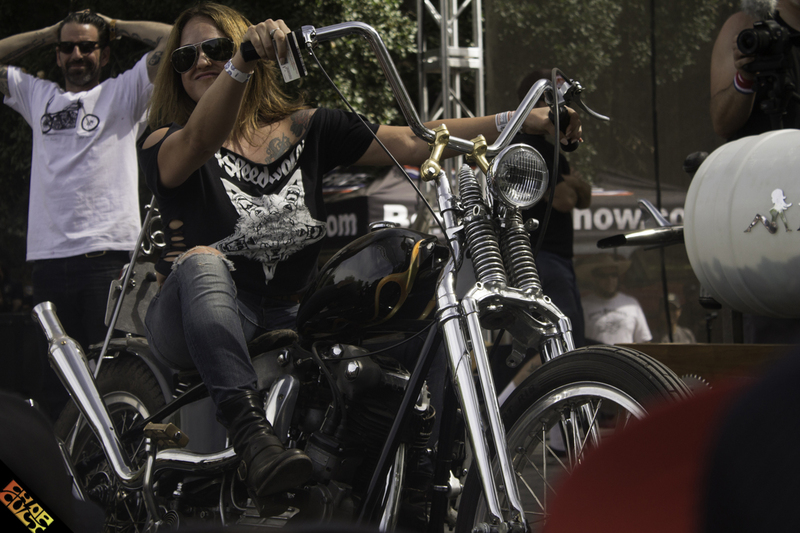 It has been said many a time that Born-Free has become the premiere bike show in Southern California. Born-Free has helped shine a light on unknown talent and has helped take small, independent brands to the next level. Most news outlets like to showcase their coverage immediately. We prefer to wait and publish our content as a “look back, but plan for the future” article. Meaning you had better request June 25-26, 2016 off from work, because Born-Free 8 is a GO! The Invited Builders have been chosen and sponsors are now being accepted. For most of us, Born-Free is a never ending hustle from December ‘til June. Last year, Mike Davis, Grant Peterson, and I used ChopCult.com to promote Ride to Born-Free . The concept was easy; get on your bike and ride to the event. A thread was created in the main forum, titled "Ride to Born-Free,” which helped connect people in different areas who wanted to ride to Born-Free together. We also requested help from ChopCult members who wished to offer their shops/homes for assistance with parts and services. Another useful tool was Instagram, as we incorporated the #ridetobf7 hashtag in our promotions. Riders who were on the journey used this tag to promote their travels. Well my friends, the imagery shared was absolutely breathtaking. The open road in all of its glory is what we long for when riding. The uncertainty of breakdowns and inclement weather are just some of the issues a rider might experience on their journey. But it’s the stories of victory shared during Born-Free that make the event awesome. I was fortunate to meet four followers and award them for using the tag, but more importantly, enjoying the ride. I’ll be sharing stories from the riders in the months ahead, with their imagery, so you’ll want to check back. I'm thrilled to announce that we'll be extending the Ride to Born-Free promotion for Born-Free 8! Photo by norman_stteb, one of the four winners. ChopCult.com also helped with promotion of the Show Class Magazine’s People’s Champ and Throttle Addiction’s Art and Fuel Exhibit. I appreciate Tim Lind and Zach Boox for allowing ChopCult to play a small role with their projects. It’s been awesome to watch both concepts gain momentum over the years. These ventures, like Born-Free, have opened the doors to talent that might have not been noticed otherwise. I hope that we continue to work together in the near future. Fellow ChopCult contributor, Jason Ochoa, was among many people who took the challenge to build a bike to debut at Born-Free. He was one of only 25 people nominated for Show Class Magazine’s People’s Champ, sadly, his 1955 FLH Panhead didn’t make it to the final six. This didn’t deter Jason; he completed the build for himself. Jason drove from Fort Worth, Texas with his wife, Marci, and good friends Clinton Wallace and Rob Taylor, with everyone’s bikes in tow. Jason hit a grand slam with his bike and I was looking forward to having it parked in front of our booth. Grant Peterson was helping someone find their vending space and within minutes of looking at Jason’s panhead, it was being parked in the special guest lot. We were thrilled for Jason because it was the nod every builder looks for. 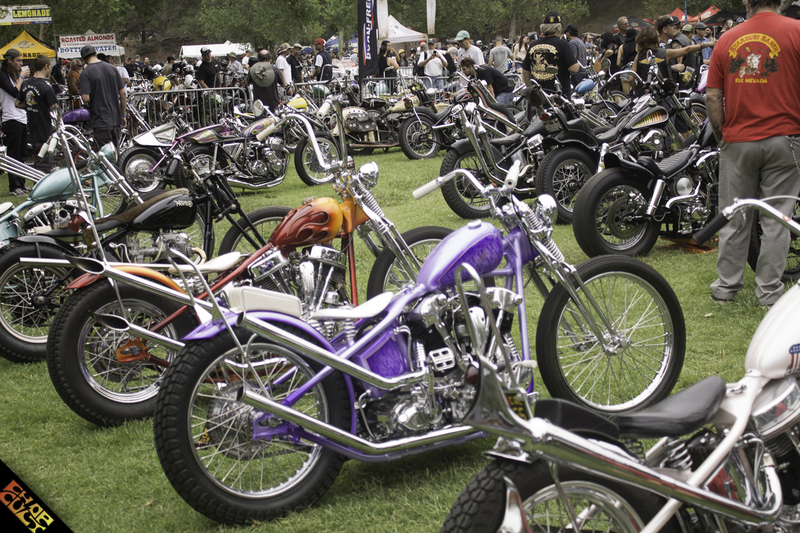 Clinton’s custom 1957 Panhead Chopper was also welcomed in the special guest lot. This was a huge accomplishment for both guys and we couldn’t have been happier. I love working Born-Free because I get to be with two great guys, Pete “Hot Dog” Finlan and my husband, Duane. Pete has been a family friend for many years and is a talented painter and pinstriper. Duane, on the other hand, has been stuck with me for 25 years, so wherever he goes I’m normally close behind. We always have a great time working the booth and love meeting everyone that stops by. I still love the fact that Born-Free isn’t mobile friendly, so we actually talk to each other vs. staring at our cellphone screens. Best Knucklehead- Arlen Ness "Untouchable"
Best in Show- Ryan Grossman "Quicksilver"
For all things Born-Free, please check out their website, and give them a follow on Facebook and Instagram. Congratulations to the 2016 Invited Builders. I'm looking forward to see what each person creates. Hell yeah, what a good bunch of pics to pull ideas from this winter. I cant wait to hit up BF8 next year. Those pics barely scratched the surface. There were so many rad bikes there a guy could be inspired until the he died. I had my favorites, but jesus, there was so much talent displayed that weekend! !